Collaborator provides advanced support for JIRA issue-tracking and Team Foundation Server work item systems, giving you the possibility to easily integrate these products into your work processes. It automatically synchronizes reviews and the issues/work items addressed in those reviews, appends the issues to the review's Remote System Links section and retrieves the item's current status. Note: There are two types of remote system configurations designed to establish integration with JIRA. They are named JIRA and JIRA Legacy. 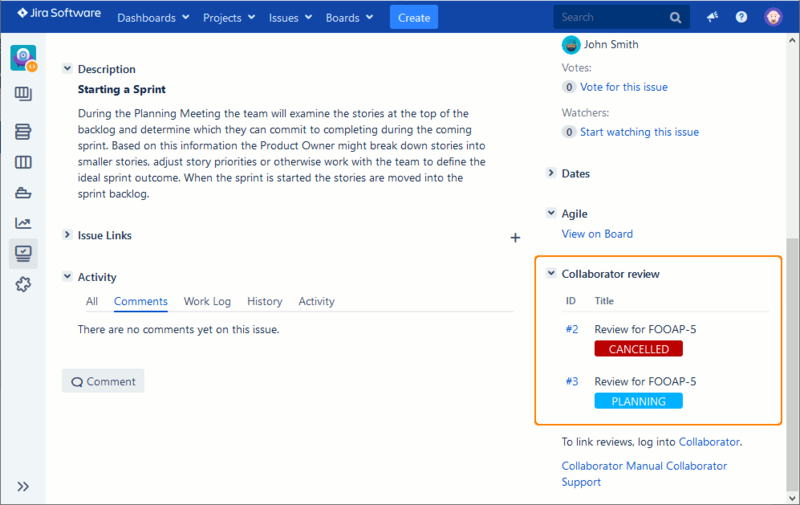 JIRA integration allows you to associate issues with reviews and vice versa, hyperlink mentioned issues, move or mirror defects from Collaborator to your JIRA server. JIRA Legacy integration allows you to create Collaborator reviews from JIRA tickets' linked commits or use JIRA as notification channel. This type of integration was introduced in earlier versions of Collaborator and we recommend that you use "ordinary" JIRA integration instead. For other issue-tracking systems, your Collaborator administrator should establish integration as described in General Approach to Issue-Tracking Integrations. JIRA server 5.0 and higher. Team Foundation Server 2010 and higher. Setup and configure integration - Your Collaborator administrator should create a new Remote System Integration configuration for your issue-tracking/work item system. The configuration defines what server to use, access credentials, list of projects to track and so on. Each single configuration instance tracks changes on a single server. To track multiple issue-tracker/work item servers, your administrators should create a separate configuration for each server. For detailed instructions on how to setup integration, see Configuring Issue-Tracking Integrations. Collaborator checks if the uploaded review materials are associated with any tickets/work items. Depending on system, Collaborator either retrieves this information from the changelist service data or parses review title, custom fields, changelist comments, comments and defects to match ticket/work item identifiers. Links ticket or work item to a review. All linked tickets/work items, as well as their current statuses, will be displayed in the review's Remote System Links section. This feature is enabled automatically, when the respective issue-tracker configuration is created and integration is enabled. Links review to a ticket or work item. A link will be appended to a ticket/work item, if an issue-tracking system permits it. This feature is enabled automatically, when the respective issue-tracker configuration is created and integration is enabled. Converts ticket identifier into hyperlink. (JIRA Only.) This is similar to creating automatic links manually, however requires less effort, since appropriate links will be configured automatically on the basis of the specified issue-tracking server. This feature is enabled by default and controlled by the Automatically Add Remote System Links template setting. Allows to create tickets for external defects. (JIRA Only.) You can create tickets in your issue-tracker directly from the Collaborator reviews. This feature is disabled by default. To enable defect export, go to the Review Templates screen, edit the appropriate template, change the Automatically Create New Work Item for External Defects setting for that specific system field to "Enabled" and select which project will be pre-selected in the dialog that suggests creating a ticket/work item. Item statuses in the Remote System Links are updated upon webhook events (if a remote system supports webhooks), or periodically (default interval is every 2 minutes and can be adjusted via VM option). The Project List field of JIRA configurations can contain up to 2000 characters, whereas for JIRA (Legacy) configurations it can contain only 255 characters. Connections established by JIRA integrations do respect proxy settings if they are specified for Collaborator server. Team Foundation Server work items do not have unique identifier except for their ordinal number. Because of this, Collaborator cannot determine work item identifiers within review's text fields (title, custom fields, comments and others) and, consequently, cannot automatically convert them into hyperlinks. Currently, creating tickets for external defects is only available for JIRA issue-tracking systems. When creating tickets for external defects on JIRA servers, the dialog may display additional fields depending on server's custom fields configuration. Currently, integration is able to retrieve and display standard custom fields. Advanced custom fields are not supported yet. If advanced custom fields are mandatory for creating new tickets, Collaborator will fail to create it. This topic describes general approach to integration with any issue-tracking system. Integration can be done in several ways depending on your needs. This section describes legacy integration with JIRA, which allows you to create Collaborator reviews from JIRA tickets' linked commits or use JIRA as notification channel.